25 Things To Know About the Christmas Village in Philadelphia! 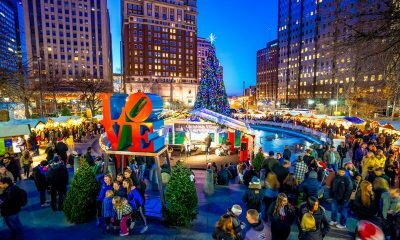 Take a Tour of Love Park’s Christmas Village Presented by NRG Home! 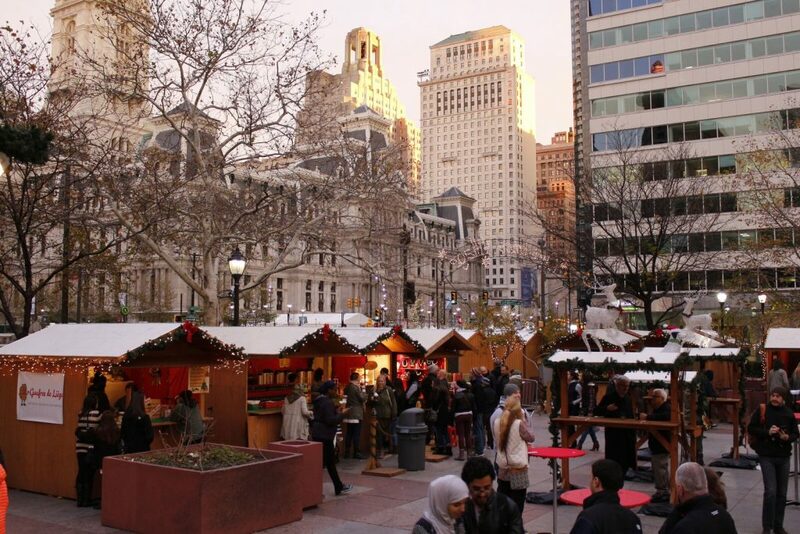 Christmas Village in Philadelphia presented by NRG will relocate in 2016 and transform Philadelphia’s City Hall (1400 JFK Boulevard) into a traditional, open-air German Christmas Market, open daily between Thanksgiving, Thursday, November 24, 2016and Christmas Eve, Saturday, December 24, 2016. Shop for high-quality, international gifts and decorations and enjoy holiday sights and sounds with thousands of twinkling lights, a new traditional carousel in the courtyard, live music, children’s activities, a new weekly happy hour series and photos with Santa Claus. Warm up with a glass of warm mulled wine or hot chocolate while tasting European food and drink. Admission is free. Prices vary for food, drink and other merchandise offered by vendors. 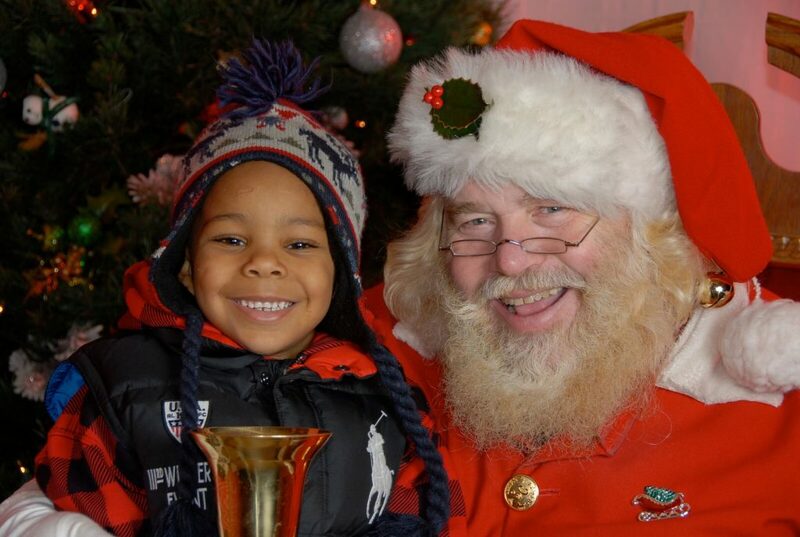 Spread the cheer by following @philachristmas on Twitter, Instagram and Snapchat, liking Christmas Village in Philadelphia on Facebook or visit the website at www.philachristmas.com. 1) Know Where Everything Is! Christmas Village in Philadelphia officially opens daily starting on Thanksgiving Day (Thursday, November 24), to coincide with Philadelphia’s annual Thanksgiving Parade. Christmas Village will remain open through Christmas Eve, Saturday, December 24.Daily market hours are Friday through Saturday 11:00am to 8:00pm, and Sunday through Thursday 11:00am to 7:00pm. Thanksgiving Day hours are 9:00am to 5:00pm, Black Friday hours are 9:00am to 8:00pm and Christmas Eve hours are 11:00am to 5:00pm. Christmas Village in Philadelphia will move its Grand Opening Ceremony from the regular Saturday to a Sunday this year (Sunday, November 27) from 3:00pm to 4:30pm. Invite your family and friends to come sing along to holiday selections by the Camden Catholic High School Band and Clearview Regional High School Choir. 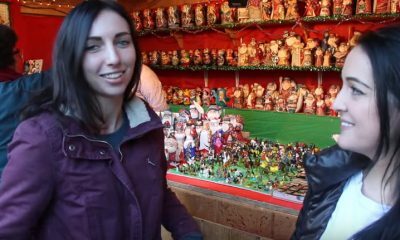 Meet the original Christkind from Nuremberg after she officially opens the market by reciting her traditional prologue. Take photos with her as she does her traditional walk of the market. In Germany, she is the person that brings the Christmas gifts to the kids, and she won’t be coming to the City of Brotherly Love empty handed! With our new location at City Hall this year, watch for a special surprise during the Opening Ceremony! Saint Nikolaus plays a major role for German kids within the Advent time. On the evening of December 5th, German kids clean their shoes and put them in front of the door. Over night, Nikolaus comes and fills the shoes with either candies and small gifts for the kids who have been good or with coals for the roughnecks.Since Nikolaus day is on December 6th, Christmas Village in Philadelphia is going to celebrate this special day in German culture at the market, too. Nikolaus himself along with Krampus will give surprises to the little ones between 2:00pm and 6:00pm! Whole Foods Market support the special appearance with a stand that provides a Nikolaus Bag for Young and Old (Stocking Filler Station). Kids and Adults can fill a bag with a Mandarin, Walnuts, Apple and Chocolate. 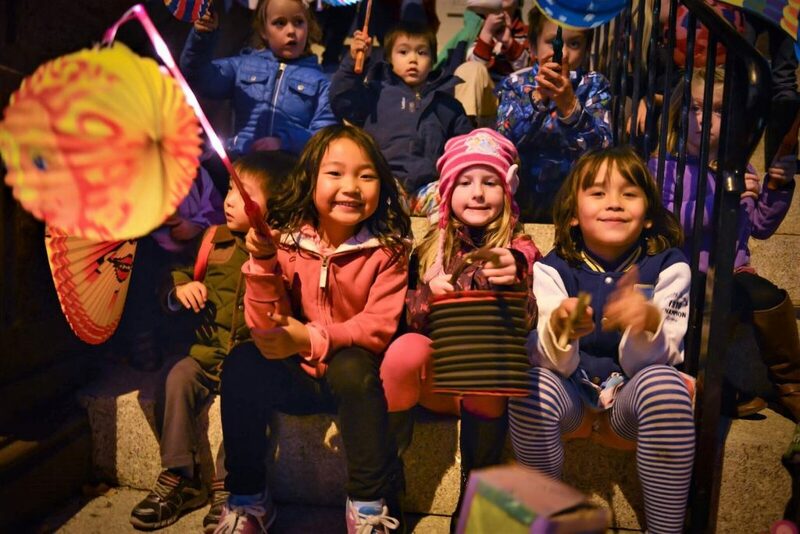 Children and families from around the region are invited to join Christmas Village in Philadelphia’s second Lantern Parade on Wednesday, November 30, starting at 5:15pm. Meet outside in front of the Christmas Village’s main stage on City Hall’s Northern Apron and join the festive procession with your homemade and decorated lanterns (battery please, no flame). Children’s carolers from Walnut Street Theatre will accompany the parade around City Hall with a stunt at the big Christmas tree on Dilworth Plaza. The highlight of the night will a stage performance by the Philly POPS Festival Brass at the market’s main stage as the grand finale. Here, the quintet will perform holiday favorites and set the perfect backdrop for a joint performance with all participants. 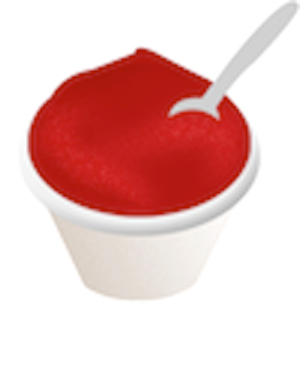 Once the parade has ended, all participants are invited to enjoy a sweet treat together. NRG will host their Gingerbread House Decorating Contest again on Friday, December 9 at 1:00pm with members of the press competing on behalf of four local non-profits (Philabundance, Big Brothers Big Sisters, Sixers Youth Foundation and last year’s winner College Settlement). Each non-profit will win a $1,000 donation from NRG for participating, and the winning charity’s house will be rewarded an extra $1,000 donation. In the evening, after the contest winner has been chosen, NRG also brings an official Eagles Player to Christmas Village in Philadelphia for a photo and autograph session at 6:00pm. On Black Friday, November 25, Christmas Village in Philadelphia invites you to head out of the office and skip the malls for a special free lunch concert from 12:00pm to 1:00pm. This year, the German Christmas market welcomes local favorite singer and songwriter Jennifer Logue on stage. 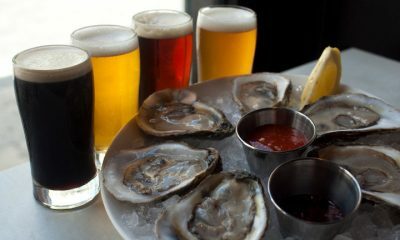 * December 7 – “Irish Christmas” and features Irish bands and appetizers on December 7. 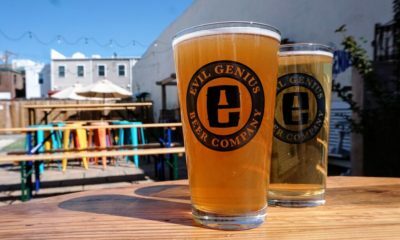 * December 14 – “Philly Christmas” along with a local band and special tastings. 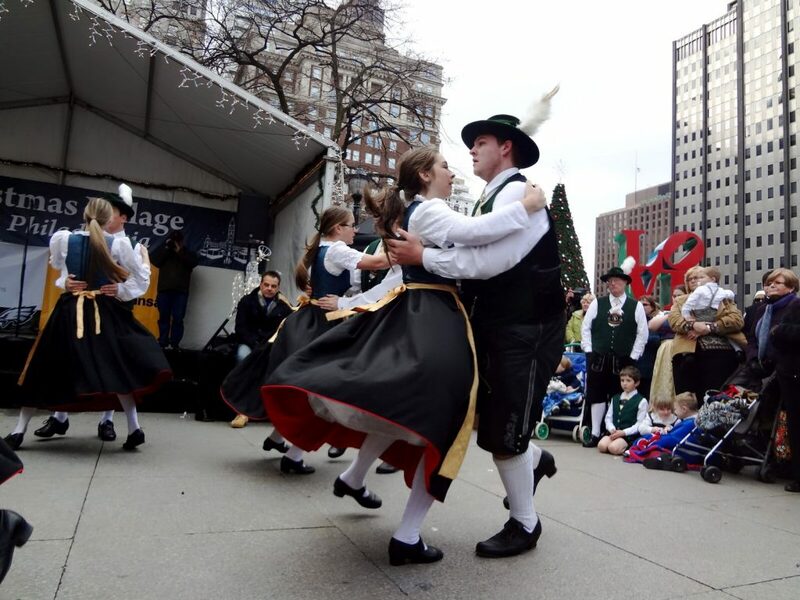 * December 21 – “German Christmas” music and dancers, accompanied by a Bratwurst Eating Contest. 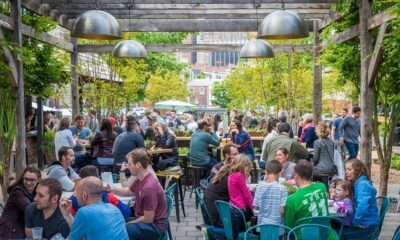 Christmas Village in Philadelphia has teamed up with Lyft, the official ride-sharing partner for the new Ho Ho Happy Hour, to help visitors enjoy the market without the trouble of public transportation, traffic, or parking. New users can use the promo code XMASVILLAGE to enjoy up to $50 in ride credit. For more information, click here. 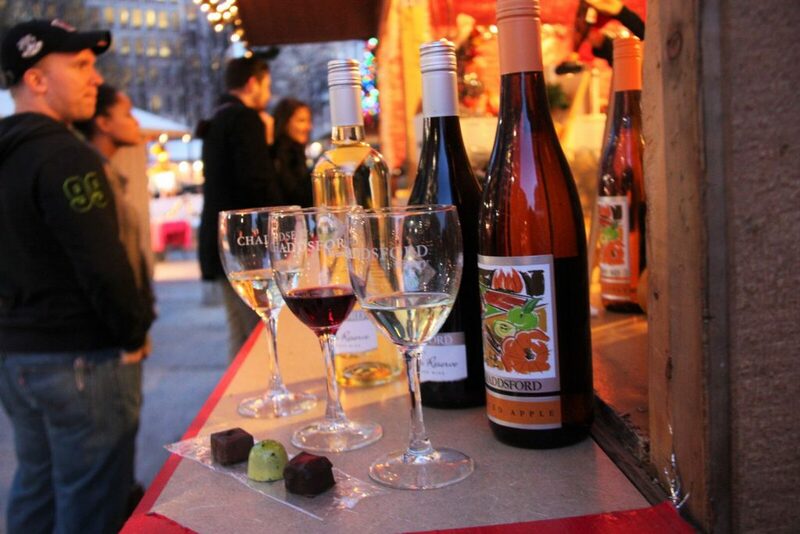 Chaddsford Winery is once again running the Tasty Tuesday and Thursday tours at Christmas Village in Philadelphia on every Tuesdays and Thursdays from November 29 through December 22. This year, the concept will change and become even more interactive with a walk around the market. Participants will purchase their tickets on Groupon and trade it at the Chaddsford Winery booth for a passport-flyer. 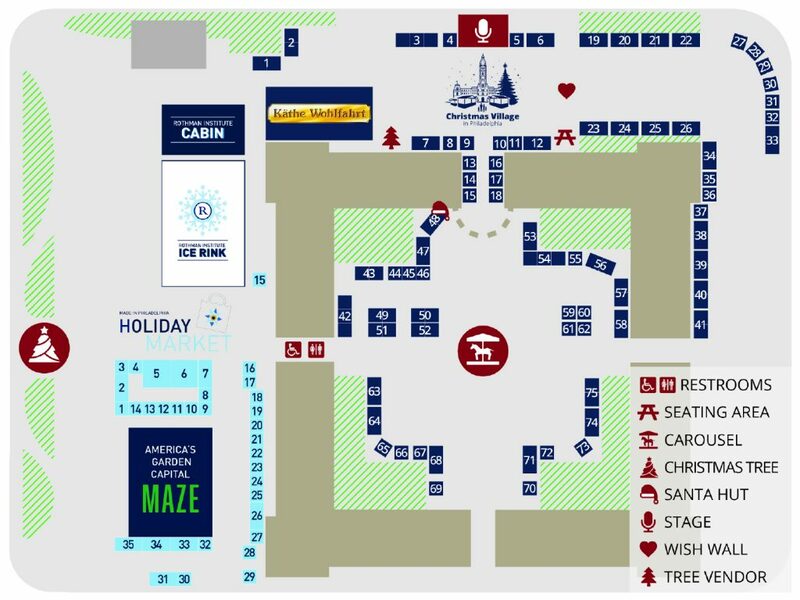 With the flyer, the customers can wander through Christmas Village and redeem coupons at the partnering vendor booths. 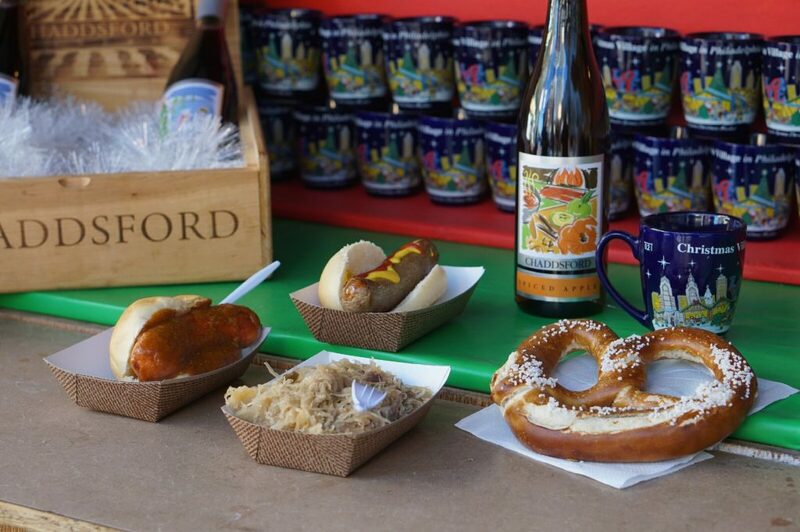 Experience the charm of a traditional German Christmas market while enjoying samples of Chaddsford’s award-winning, locally-produced wine, as well as sweet and savory tastings from Pretzelphoria, Brunkow Cheese, German Sweets, Shane Confectionary, and The Bacon Jams. All students are invited to enjoy Christmas Village on a Tuesday with special offers on food and drinks to bring life into the monotony of everyday school life. 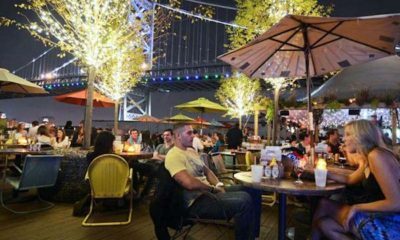 On Wednesday, December 21 from 5:00pm to 7:00pm, Christmas Village in Philadelphia will host its first annual Bratwurst Eating Contest as a part of the German Christmas Ho Ho Happy Hour. It is an amateur competition with no entry fee. Each contestant has to eat as many Bratwursts as possible (max. 10) in fifteen minutes. The contestant who eats the most or finishes them all first will be declared the winner. The prizes will be entry tickets from the partners and/or gifts from Christmas Village. Interested in participating? 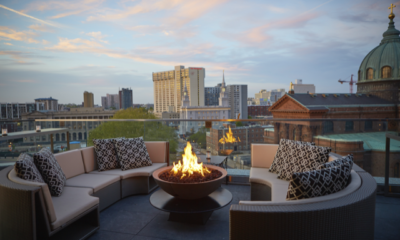 Get more information at event@philachristmas.com. 16) Know Where to Buy Your Gifts! Christmas Village in Philadelphia is made up of more than 80 booths and a big vendor tent, much like those found in traditional Christmas Villages in Germany. Within this village, you’ll find a wide variety of seasonal goods and gifts that you won’t find in any common shopping mall. Aside from our American vendors, we have German and international vendors selling Christmas decorations from genuine Erzgebirge, nativity sets, glass ornaments in assorted sites, toys, jewelry and so much more. * Photos – Santa’s House − Get your photo with Santa Claus! Santa will be visiting on every Friday, Saturday and Sunday and offers family photos inside his hut. There will also be other family fun like story-telling, caricature artists, face painters, music and more. Schedule will vary by weekend and day. The new kids’ corner will be open Saturdays 11:00am to 8:00pm and Sundays from 11:00am to 7:00pm. 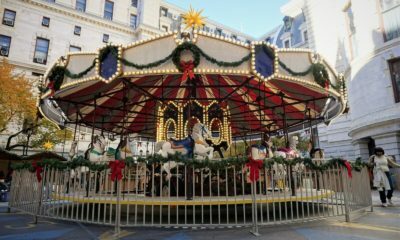 This year, a traditional carousel can be found inside the Courtyard which adds to the atmosphere of an authentic Christmas Village. Tickets will be available at the market for a small price. Woof woof! New for the season, bring your pup down for pet photos with Santa during every Friday, Saturday and Sunday during regular market hours. 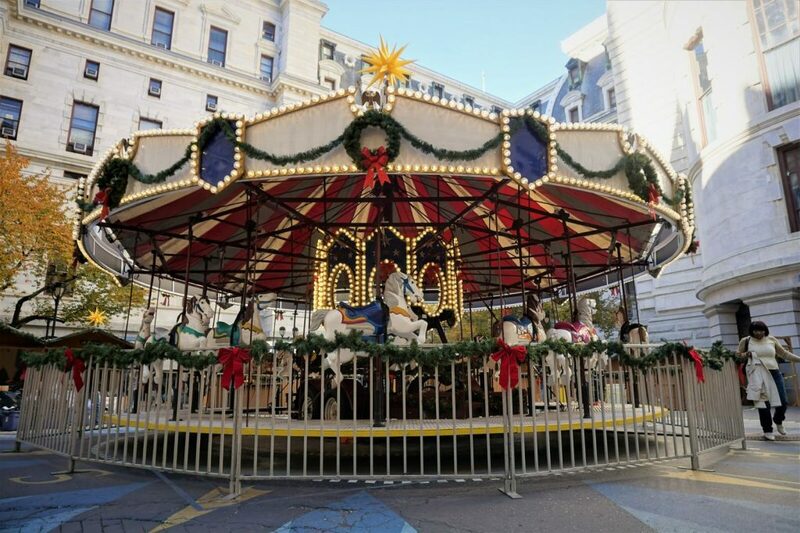 Look a whimsical, ornate and grand carousel at the center of the City Hall Courtyard that will give children of all ages a new holiday tradition while visiting the authentic German Christmas Market. The carousel features 20 wood carved horses that will twirl around for an unforgettable view of the new market inside City Hall’s courtyard. Carousel rides are $3.00 each. The whole market will be illuminated in the light of over 55 Original Herrnhut Stars presented by MyBrilliantStar. You can discover stars on the top of each booth, but the highlight will be the big Herrnhut Stars in a diameter of 1.30 m / 51 inch, which will float high above the main stage and the entrances of City Hall’s courtyard. Look for more special decoration elements this year that will transform City Hall into a winter wonderland. Now in its ninth year, Christmas Village in Philadelphia has grown into the region’s most unique and charming holiday attraction. It expects to attract more than 775,000 people in 2016. More than seventy international and local merchants and artists are busy preparing high-quality gifts that will be sold in decorated tents and wooden houses that will pop-up throughout Center City’s famous City Hall. With toys, apparel, jewelry, decorations, home goods, artwork and more, there will be something for everyone on Santa’s list. Christmas Village in Philadelphia is presented for the fourth straight year by NRG. NRG staff will be onsite during the entire season to greet visitors at the market. The company’s annual Gingerbread Competition with local media celebrities is scheduled Friday, December 9, 2016 at 1:00pm. 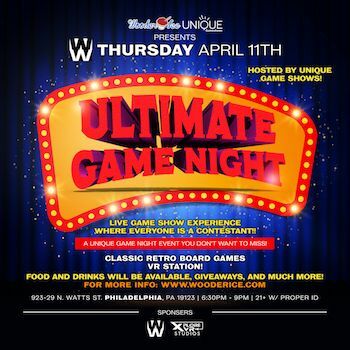 Later that evening, NRG will host a photo and autograph session with an official Eagles Player at 6:00pm. The following Fridaynight, December 16, Eagles mascot Swoop will leave his nest and wander through Christmas Village in Philadelphia. The sponsorship opened up a lot of new possibilities for the market and has been a great support over the years. Therefore, it wasn’t a hard decision for Christmas Village in Philadelphia to team up with NRG again. NRG is the leading integrated power company in the U.S., built on the strength of the nation’s largest and most diverse competitive electric generation portfolio and leading retail electricity platform. A Fortune 200 company, NRG creates value through best in class operations, reliable and efficient electric generation, and a retail platform serving residential and commercial businesses. Working with electricity customers, large and small, we continually innovate, embrace and implement sustainable solutions for producing and managing energy. We aim to be pioneers in developing smarter energy choices and delivering exceptional service as our retail electricity providers serve almost 3 million residential and commercial customers throughout the country. More information is available at www.nrg.com. Connect with NRG Energy on Facebook and follow us on Twitter at @nrginsight and @nrgenergy. Spread the cheer by following @philachristmas on Twitter, Instagram and Snapchat, liking Christmas Village on Facebook or visit www.philachristmas.com. 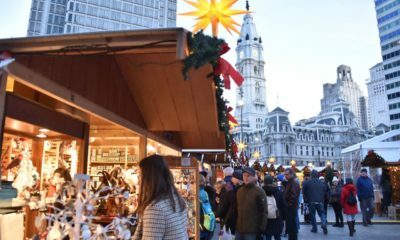 Philadelphia’s Dilworth Park will once again host the annual Made in Philadelphia Holiday Market, open everyday from Saturday, November 19 through Saturday, December 24 (Christmas Eve). At the Made in Philadelphia Holiday Market, visitors will experience a charming winter bazaar with more than 30 local vendors in white, festively lit tents. 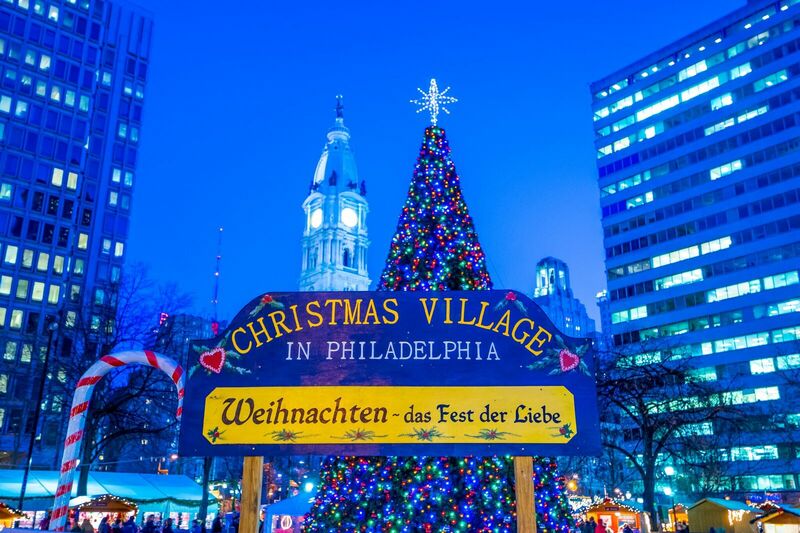 Compared to the authentic German Christmas Village with international vendors, the Made in Philadelphia Holiday Market offers its abundance of arts and crafts from local sources within the greater Philadelphian area. With such a wide selection, visitors will be sure to find the perfect gift for their loved ones or themselves, like fashionable jewelry and clothes, unique decoration items, and much more. 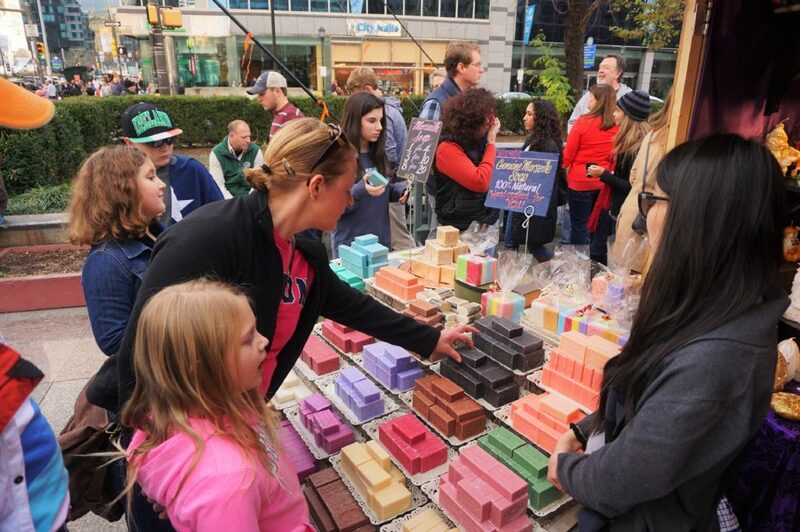 At the same time, a wide variety of locally-made sweets and food will be available for visitors’ enjoyment, as well as ice skating on the Rothman Ice Rink, conveniently located adjacent to the Holiday Market. Made in Philadelphia Market is presented by Center City District in partnership with German American Marketing, Inc. (operators of Christmas Village in Philadelphia). Skygarten is Introducing a Spiked Hot Chocolate Bar 51 Stories up!